This entry was posted in Books and tagged comfort read, D E Stevenson, Listening Valley, romance, Scottish author, Scottish setting, WW2 setting by Katrina. Bookmark the permalink. 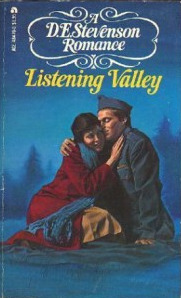 Katrina, I had forgotten what a good story Listening Valley is. Your review inspires me to think about re-reading it. I have a hard copy with a dust jacket in rather rough condition, but it has a picture of what is supposed to be Tonia and her husband on the cover. It was published in the US in 1976. Interesting thought about Stevenson’s characters and her relatives. Makes you wonder…. Yes, I’m fairly sure she had relatives like that in a previous book, I’ll be looking out for similar folk in her other books now! I still have a few unread now due to a very good haul from an Edinburgh bookshop recently.